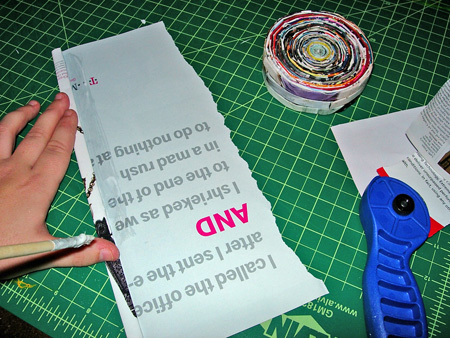 Start folding the page at about a quarter inch thickness until it has a little bulk to it. I don’t suggest using the whole page, it get too thick. 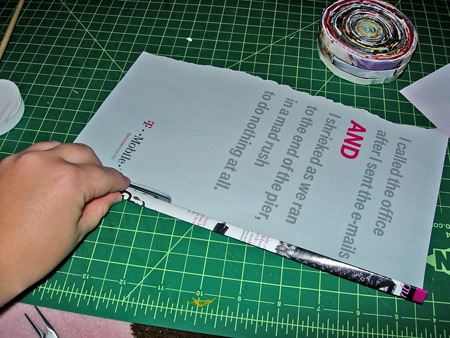 Glue the edge and cut off the remaining page. You now have your first strip. 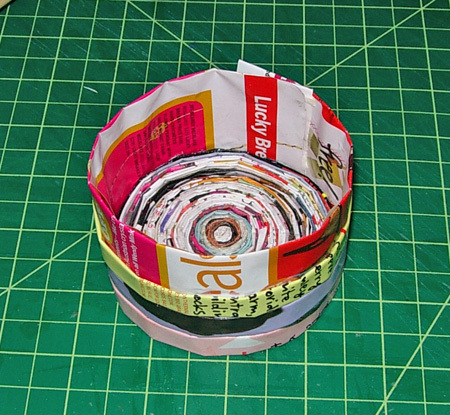 Roll it into a circle like you are making the base of a coil pot. 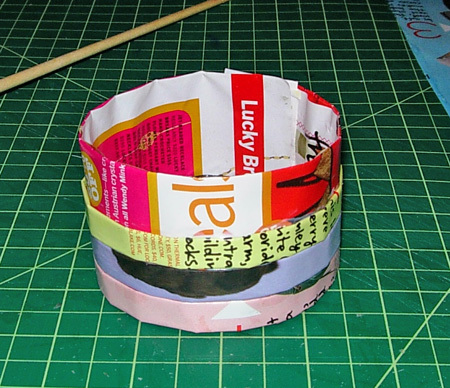 Continue making strips and rolling them until you reach your desired diameter for your box. Make sure it doesn’t get away. 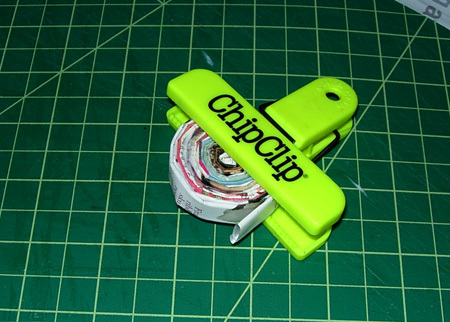 I clip mine so the glue can dry without unrolling. 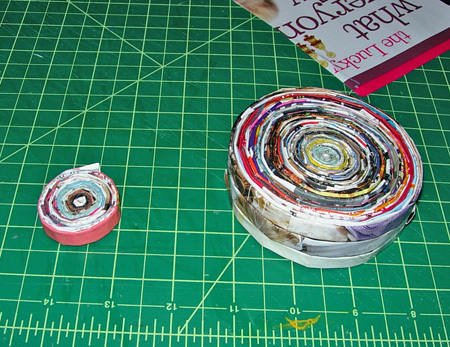 Roll a strip that is about an inch thick (or whatever works best for your box). 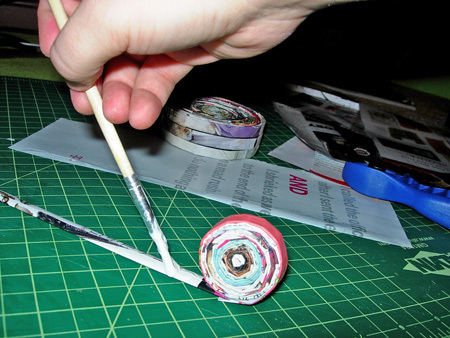 Glue it to your roll. You’ll now have what looks like a lid. To give it more support. 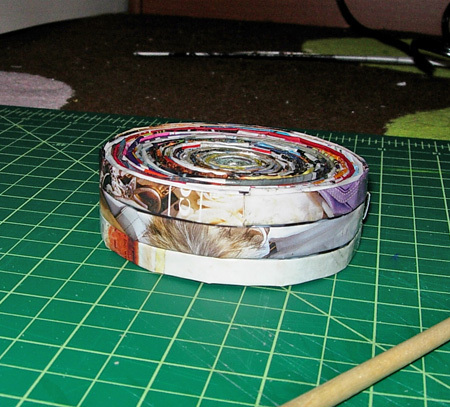 Make thinner strips and glue them to the outside of the thicker strip until it looks kinda like this. Here’s what the inside looks like. You can see the inner part is a thicker (about one inch) strip with the little ones glued to the outside. Make another roll for the bottom. Be sure to make it slightly smaller so the lid will fit on the bottom. Here is my lid next to the beginning of the bottom of the box. 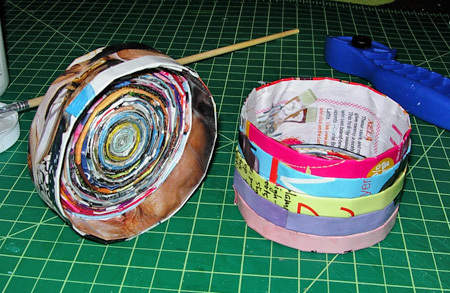 Do the same with the bottom as you did with the top in making a thicker strip to glue thinner strips to on the outside, but be sure your big strip makes a circle that will fit inside your lid. 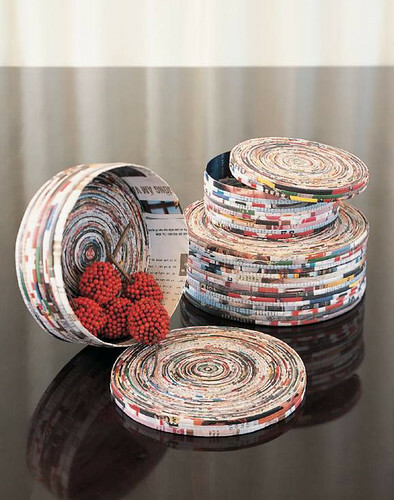 Do not put the thinner strips all the way to the top so it creates a little ledge for the lid to rest on. The top pink strip is actually tall enough that it is glued to the bottom of the box. On the outside of this piece, I glued thinner strips so it all looks the same. Finished! Please excuse the messiness. this was my first attempt. Enjoy! If you have any questions, please feel free to comment. 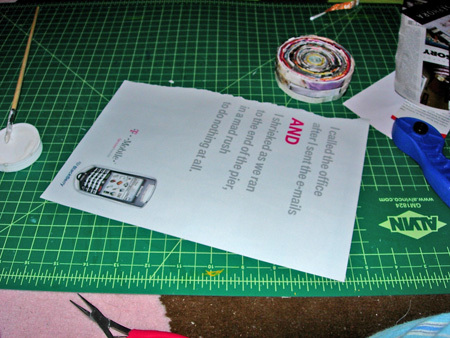 This entry was posted in Craft, I Make:, Tutorials and tagged abstract, blog, box, craft, diy, magazine, octopus, project, recycled, tutorial. Bookmark the permalink. These are amazing!! What type of glue did you use? Regular…I’m not sure. I made them a while back. I think it was just tacky glue from the craft store. I found this tutorial while i am sitting here at work, so now I am super anxious to leave and try it!!! Thanks! Wow so cool!! i can wait to share this with my roommates. found your blog though goggle images.thank for the inspiration! I’ve done this and it takes a bit of your afternoon away, but using a glue stick really speeds things along!you just swipe the stick and press, the paper will not unfold at all! 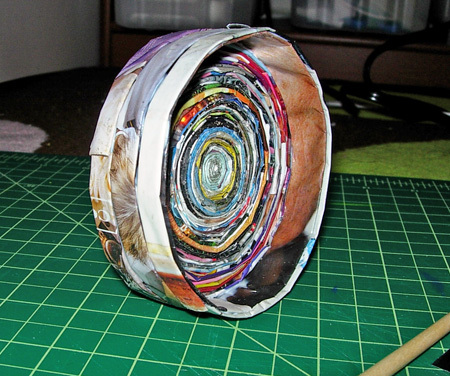 then, after it was done, i went back over the whole thing with Mod Podge, sturdy and awesome!